Busan Metropolitan City will sponsor the 12th Busan International Rock Festival at Samrak Riverside Park for three days beginning Aug. 5. The event will feature local and overseas acts from the U.K., Japan, Taiwan, Germany and India. The festival was put together by the Organizing Committee for Busan Culture & Tourism Festival under the slogan “Samrak (Music + People + Nature),” and is a leading music event in Korea, representing the openness, youth and coastal city characteristics of Busan. It is organized with the goals of showcasing new musical talent, revitalizing the music industry and celebrating indie bands. Along with the international film festival in October, the Busan International Rock Festival has played a vital role in promoting the artistic affluence of Busan, the largest port city in South Korea. It is widely recognized for strengthening ties between renowned musicians worldwide. This fun and widely attended event is a must-see for any rock fan in Korea. The lineup includes D’Hait, Rots, Dickpunks, Romantic Punch, Go Go Star, One Drop East, Blanks, Steranko, YB, Nevada 51, RockVan, Myrigya Band, bye bye sea, Kingston Rudieska, Every Single Day, Crying Nut, Mongol 800, Buhwal, Def & Contenders, Mahatma, Chthonic, Prana, Pia, Guckkasten, Nobrain, Heaven Shall Burn and Kim Chang-wan band. To get there from Seoul Station (Subway Line 1, 4), take a train to Busan Station. Go to the bus stop in front of Busan Station (17m) and take Bus 2 or 98, getting off at Dadaepo. By KTX the journey takes two hours and 40 minutes. The cheaper Saemaeul takes a little under four hours whereas the Mugunghwa is five hours and 20 minutes. For Busan Transport exit Sinpyeong Station or Geojeong Station on Busan Subway Line 1 and take bus 2, 11, 96, or 98 and get off at Dadaepo Beach. 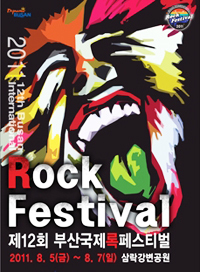 For more information call 051-888-3395 and 051-1330, contact emaster@korea.kr or visit the festival’s Web site at http://www.rockfestival.co.kr.